If hitting up the trendiest bars and nightclubs is your thing, then the Greek island of Mykonos is for you. One of the most visited Greek Islands; Mykonos is located in the Aegean Sea as part of the Cyclades. It’s a well-known cosmopolitan destination known for its exciting nightlife scene. Mykonos Town, or Chora, is the island’s port and capital. 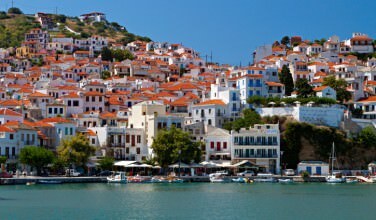 It’s a picturesque Cycladic town that features whitewashed buildings, tiny maze-like streets, upscale shopping boutiques, restaurants, cafes, art galleries, and bars. Visitors can find brands such as Lacoste, Dolce & Gabbana, Naf Naf, Diesel, and Body Shop. Ano Mera is the other primary town of Mykonos. It’s the only inland settlement. 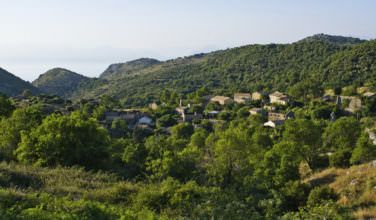 It has a large city square that is lined by Greek tavernas. Like other Greek islands, Mykonos has beautiful beaches that feature golden sand. None of the beaches are too large, so crowds are often unavoidable during the busy summer months. Most beaches have tavernas, restaurants, beach umbrellas, and deck chairs. Paradise Beach is a top attraction. It’s known as a party beach from dusk through dawn. 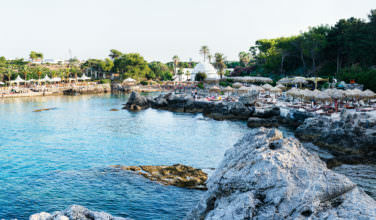 Visitors can experience the party or just enjoy the warm water and sandy beach. There’s plenty for an adult to enjoy, but it’s best to leave the kids at home. 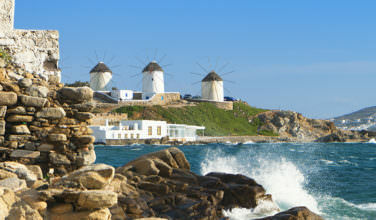 If you’re looking for a more family friendly attraction, visit the windmills of Mykonos. The group of 5 windmills in Mykonos Town are the most recognized landmarks of the island and are the first thing to see when a ship gets close to the harbor. There are 16 windmills in total on Mykonos that were built in the 16th century. At one time they were used for grinding wheat, but they stopped being used in the middle of the 20th century. A popular excursion for tourists is a boat ride to the nearby island of Delos to visit its ruins that include Cleopatra’s House and the Temple of Apollos. Mykonos is known as one of the world’s liveliest gay-friendly destinations. 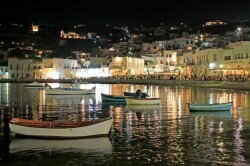 Mykonos Town features many gay-centric bars and hangouts although most are not gay exclusive. The focus of the late night gay scene is the waterfront area, between the Old Harbour and the Church of Paraportiani. Because it’s so popular, Mykonos can be quite pricey, but is worth it to those that enjoy relentless partying. If you happen to be looking for a quiet hotel, be sure to stay off of the main streets where bar noise until dawn is common. The island is small which means that tourists can easily get around by car, bus, or scooter. Mykonos has air connections to Athens and Thessaloniki and London flights during peak tourist season. There are ferry connections to the mainland ports of Piraeus and Rafina and to neighboring islands. The ferry quays are Old Port, 400m north of town and New Port, 2km north of town and passengers should always check which quay the ferry leaves from.